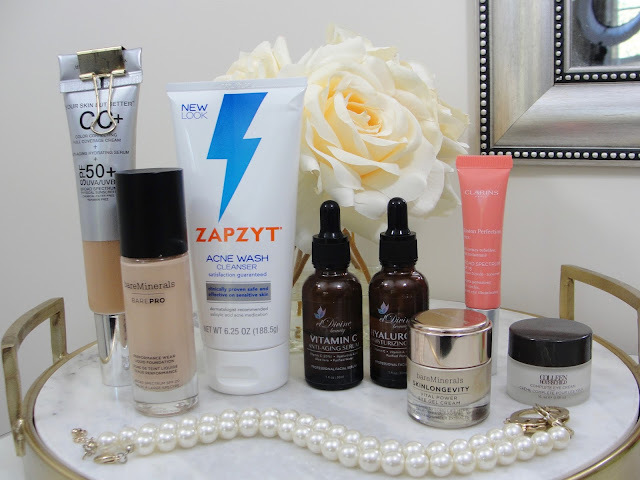 I think it has been FOREVER, since I shared with you my skin care routine! Since I am now over 40, I try to really use only the best and most effective anti-aging ingredients! 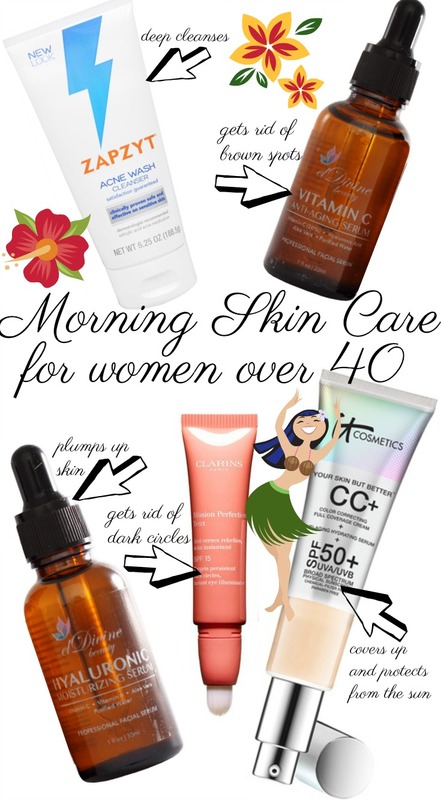 I also have to try out a lot of skin care products, because I get send so much, so that always throws me off...but here is what I currently do in the morning. You can also check out my night routine. I pretty much reduced and simplified the amount of products I use, since I only want to use products that are most effective in my anti-aging regime! Just quickly about my skin type, so you know if this skin care routine might be suitable for you too: I have combination skin: oily on my t-zone (forehead, nose, chin), normal on my cheeks and very dry around my eyes. I don´t have sensitive skin and fragrance does not bother me. I do get break-outs here and there- usually on my chin and lower cheeks (almost neck area!). Currently I have a BEAST on my right side! Geez! That one hurts! LOL! 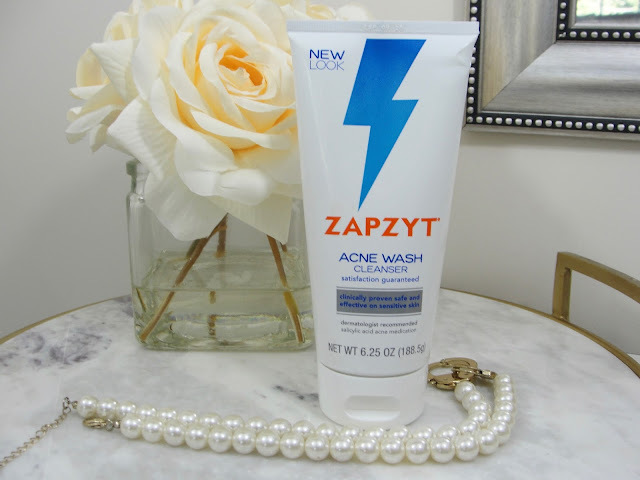 I like many facial cleansers, but I use currently the Zapzyt Acne wash, because it is deep cleansing and super affordable! I also like Paula´s choice Resist (super creamy), Murad Essential C (smells like citrus! ), Ole Henriksen The Clean Truth (self foaming and smells like oranges!). 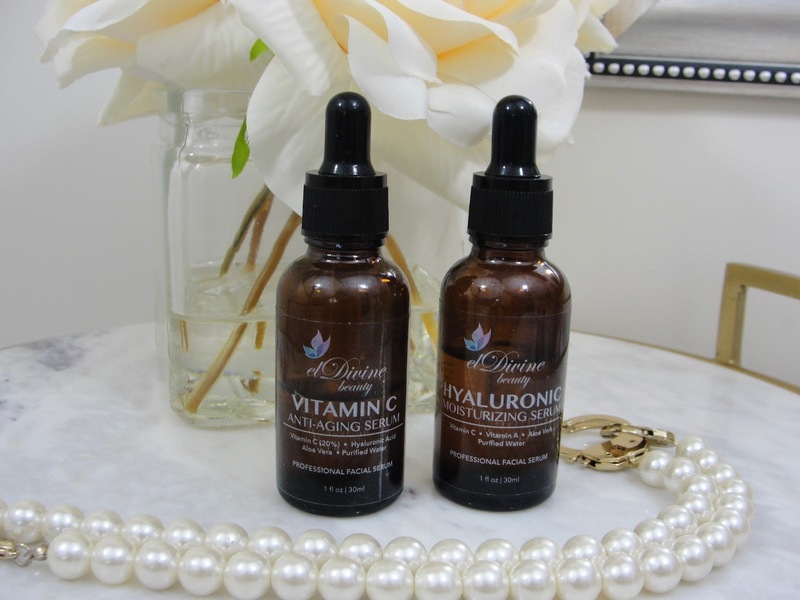 I rotate my Vitamin C serums- there are many good ones out there. I wrote a whole post about it here, but currently I use the Eldivine Vitamin C serum, but I am a huge fan of the belitae Vitamin S serum too. Vitamin C is a natural antioxidant that helps to achieve a more even skin tone and really gets rid of those dark brown spots! Make sure you use one that contains 20% Vitamin C for a maximum effect! Again: there are many awesome choices out there and I rotate frequently. I use at the moment the one by Eldivine, because it came in a set with the Vitamin C serum. It´s really great and affordable! I like the Hyaluronic booster by Paula´s choice also! 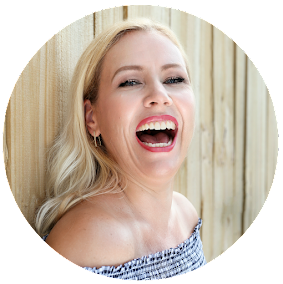 Hyaluronic Acid plumps up those skin cells and after a couple weeks of use, you will notice that your skin looks less wrinkled! But don´t expect a miracle overnight! Keep using it! There is a big discussion in the beauty community going on, if we need an eye cream or not. I wrote about this here and my take is: if you feel like you need one: use one! ;-) I definitely feel like my DRY AS DESERT EYE AREA needs one! I could (not only could: I do!) 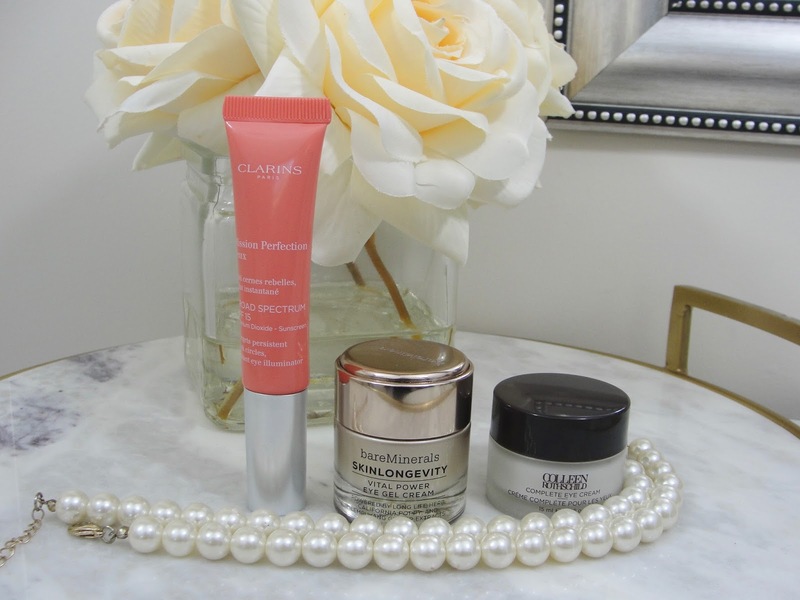 skip a moisturizer- but an eye cream I NEED! I want an eye cream that makes my skin feel plumper and hydrated- but NOT greasy please! Good ones that I love: Colleen Rothschild Eye Complete (wears so well under foundation! ), the Bare Minerals Skinlongevity (makes my eye area feel like silk! ), the Clarins Mission Perfection (includes a really handy brush and is already tinted for immediate coverage!) and the (not pictured but I have re-purchased many times) Derma E DMAE eye lift (feels lifting and hydrating). OK! I have to admit something: here I am preaching over and over, that we are supposed to wear sunscreen because... yada yada ...the sun is so damaging and aging us...however secretly I have kinda stopped applying it. Why? You know I am THAT oily! And even the best sunscreen, that promises to stay matte, gives me somewhat of a heavy feel that I don´t want. I don´t want to apply so many layers of products! I just find that my skin does not look or feel better with sunscreen. Of course, if I would go to the beach or pool, I would wear sunscreen. On a daily basis though, I rather use a foundation that includes SPF! One product that does it both: protect and cover up! 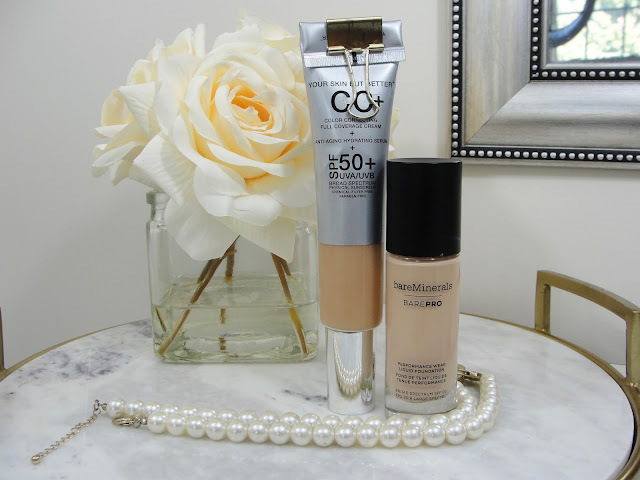 I really like the IT Cosmetics CC cream (inlcudes SPF 50! YES!!!) and the Bare Minerals Barepro (SPF 20). The IT Cosmetics CC cream is actually not really for oily girls like me- but it doesn´t bother me too much- a little powder and all is good- and glowy, I admit! ;-) The Barepro however: STAYS MATTE ON AN OILY GIRL LIKE ME! YAY! Disclaimer: I received some of the products mentioned above for free. Regardless, I only recommend products or services I use personally and believe will be good for my readers. Contains Affiliate links. Read my full disclosure.